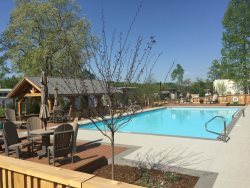 Red Bud Tiny Home at the Village at Flat Rock, NC A Simple-Life Community, convenient to the Clubhouse for a yoga class, a game of pool, a swim in the pool, a game of Bocce Ball, relaxing at the Clubhouse with friendly residents and other guests. It is just 1 mile off Route 26, and minutes into downtown Historic Hendersonville, Flat Rock, and short drive into Asheville, Lake Lure, Chimney Rock, Saluda, or Tryon Equestrian Center. Red Bud is Pet friendly, Bring your small dog. This Tiny House has a delightful lay-out, each private bedroom is on either end of the house for plenty of privacy. One has a Queen Bed, Flat Screen TV, large closet and drawers, full length mirror and steps out onto your over-sized deck .The 2nd bedroom boasts a bunk bed, top is twin and bottom is a Full, TV with DVD Player. There is also a comfortable Futon for sitting or sleeping in the open area.The TV is in the living/open space with table and chairs for enjoying your meals.Step out on to the patio for a cook-out on the charcoal grill and sip your wine at the table and chairs and listen for the birds in the Village, it truly is a peacefully setting.The kitchen is well designed with pantry room above the Stainless Steel refrigerator, a Flat Top stove/oven full size, along with a microwave.Make your morning coffee in the coffee pot, mugs/cups provided.There are drinking glasses and wine glasses, place settings for 5.Cleaning Supplies are found under the sink and there is laundry detergent if you need to do a small load there is a stackable washer and dryer in the closet in the bedroom. Enjoy a fairly spacious bathroom for a Tiny House, it offers a walk in shower and very nice vanity and plenty of plush towels and toiletries. Heating and a.c. system with remote control. You will get a great feel for what it's like to live comfortably in a TINY HOME here. Or if you are just wanting a getaway, this is a great place to enjoy yourself. Convenient to hiking, shopping, dining and grocery stores. A Special Letter from the Owner of the Red Bud to you, her Guests! 'I am so excited to be able to share my “tiny house” Red Bud with you. After your relaxing stay, I bet you’ll want one of your very own! My first reason for buying in the Village at Flat Rock, NC Tiny House community was to be close to my grandchildren who live in Asheville. I live six hours away, so quality time had not been an option. I was so excited to find this quiet, safe community of Tiny Homes. I’ve been here almost one year and have already made so many wonderful memories with my grandchildren that I hope they will remember forever. My 4-year-old grandson loves to stay at “Nan’s tiny house.” He loves his room with the bunk beds and likes to “fish” in the pond and swim in the pool during the summer months. Please bring your trash bags to Dumpsters beyond the Laundry/pool/Club House area. Dumpster #1 on the left is household trash only. Nothing else! Dumpster #2 in the middle is for FOLDED cardboard...thus the reason for the narrow slot! Dumpster #3 on the right for all recycled material that has a recycling triangle on it to include paper EXCEPT for Department Store and Grocery Store plastic bags.